Second hand shopping can be such a pleasant surprise! One of my sisters sometimes goes to an opshop and gets great stuff from there! A versatile tee for $2? Yes please!!! 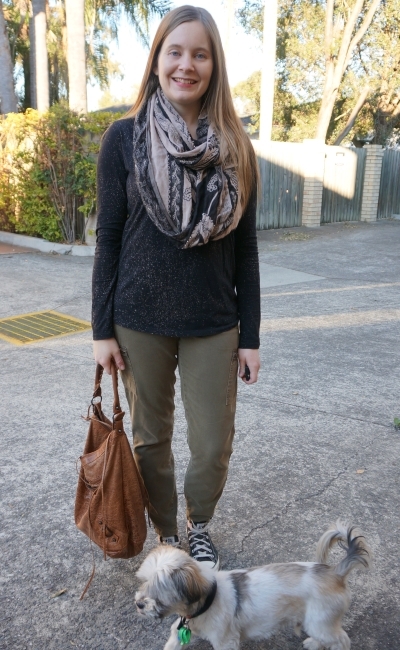 I also love how the neutral shades of green and camel work together in the second outfit. Hope you and your gorgeous family have a nice weekend, dear! Thanks Deb! I love the prices, I just wish I had more time to browse, it's hard with two little ones! Hi pretty lady! I enjoyed your wardrobe tour! I really adore your green pants. That dash of color adds a cute and fun touch to the look. The tee compliments perfectly and keeps the focus on the pants. I pray you and your family are having a wonderful weekend! I'm definitely going to have to get back into thrifting too with a mortgage payment to worry about! It's a great option for saving money AND the environment! Second hand shopping is so much fun and you get such a good feeling from finding something special! I really like the green trousers in the first pictures, so much fun! Great post dear, so nice and interesting, love it! I love your outfit! The green trousers are fab! Have a lovely weekend. I'm all about shopping the thrift store, Clearance rack and Hand me Down. Since becoming a SAHM. I don't buy a lot of new clothes for myself. My husband is the same way. We used to buy new clothes all the time. Now we just buy what we need. Which isn't much. Since we both have a lot of clothes. I'm the same, I've found my shopping has really slowed being a mum - budget is one part of that, but lack of time for shopping is another big one! haha! Oh gosh Mica, I actually feel quite guilty! I know that I could definitely be more thrifty and friends of mine have found some fantastic pieces. I think it's somewhat ingrained in me to the point that when I need some new wardrobe pieces, my feet just walk me straight to my usual shops. I definitely need to take a charity shop tour! You've got some fab pieces! Oh don't feel guilty! Everyone is different! I just enjoy browsing, I'm sad my go-to store is closing so it will be harder for me to find bargains in future! Great way to add accessories. I'm so loving your green pants. They're super chic even with just a tee. I've never tried second hand shopping before. Definitely open to the idea! Worth trying it, you can find so many bargains! Both looks are great. I love the pop of color from the green pants in the first look and the earthy neutral vibes of the second one. Makes me think I should try thrifting. I hope you do give it a go and find some bargains! 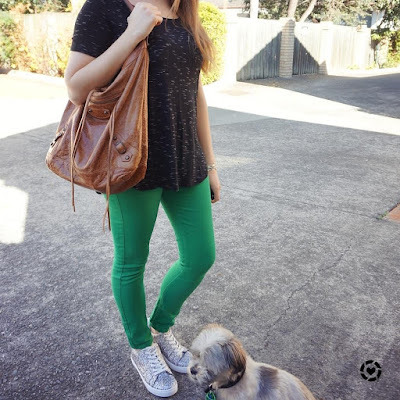 What a great day bag, and I love the green jeans! You know I love those glittery sneakers!!! :) Thrifting is so fun. You always find such great stuff, Mica!! Thanks Jess! They are so fun and cheerful! 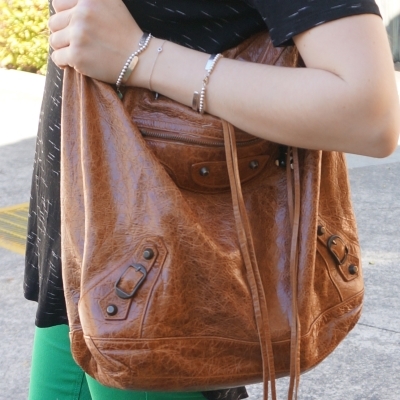 Getting a second-hand bag is a great idea if you just want something functional, trendy, and not break a bank for. Love the sweater and scarf pairing in the second outfit. Wow, you get such great deals! Thank you! I've got so many handbag bargains that way! I love both pairs of green pants. The bag is really cute too! I love to second hand shop! Both looks are so chic and loving the sneakers with your second look. I never have luck with shoes when I am second and shopping either, my size is rarely available. Glad I'm not alone! I'm always jealous of those who find such awesome bargains! Truth is Balenciaga got me! That's so frustrating Emmy :( I hope a store opens nearer you soon with some great finds in it! :) The hat doggie was so fun, no idea where it is now unfortunately! So cool that you got that Balenciaga second hand! Thanks Rena! I think splurging on accessories really works well for me! I do love a good bit of second hand shopping, there’s always some hidden treasures out there and when I think of some of the lovely bits that I’ve donated too, I know others will be doing the same and it keeps me going back. It's nice to see your room with your bags and accessories. You've got a lot Balenciagas and your accessories are really nice. I like watching videos like this :) Wishing you a fun weekend ahead. You got some great deals with your second hand shopping! I never seem to do very well when I try to thrift shop. I'm so lucky to have some good stores around me! 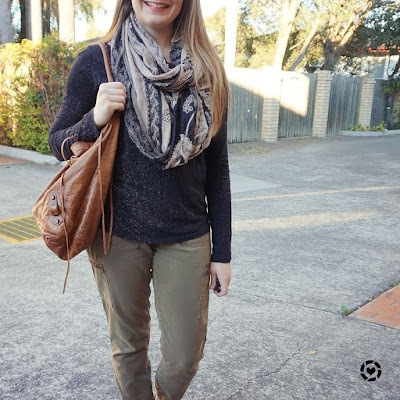 Fun outfits - you know I love the green trousers! Good for you for promoting second-hand shopping - that's where my heart is. Have a good week, Mica! Thanks Sheila! It's a fun way to shop, I just wish I had more time for it! Love your outfits! 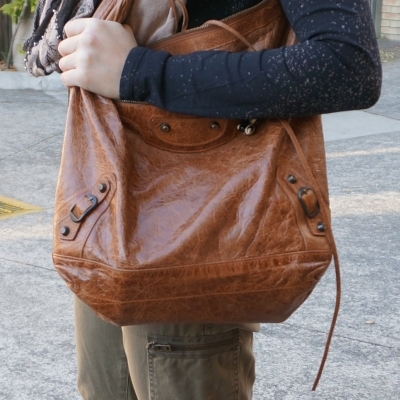 I need a nice big bag like that, my current one is falling apart lol! Love a bargain! And looks great too. Love thrifting! The thrill of the hunt always gets me. Although I will say I want to curl into a ball and cry when I find something gorgeous that's not my size. haha yes it's so frustrating when a lovely find doesn't work for you! I am loving those pants on you!! The bag is gorgeous! Looking good, Mica! Happy Monday lovely! I really love this bag, such a classic! Also, your pooch is the cutest! Thank you, he really is! Both of these looks are so fun! I love the olive pair that you scored second-hand, what a great find! I haven't gone secondhand shopping in a while but I hope to do more this fall. I'd forgotten how you use to have all this extra space... and I did not recall you having so many accessories!! OMG!